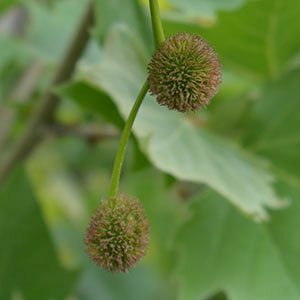 The London Plane Tree is a large growing tree to 30m in height although often smaller to around 20m in cultivation. London Plane Trees or Platanus x acerifolia ‘Bloodgood’ are a large growing deciduous shade tree widely used in street plantings in Melbourne suburbs in particular. Reaching around 20 – 30 metres in height with a spreading crown to 18 metres these are a large shade tree. They survive well in urban situations and tolerate pollution well. Being such an easy care tree, once established they require little pruning, are drought tolerant and do not need fertiliser in most reasonable soils. Great lush green foliage though spring and summer, good autumn tones and attractive mottled bark which is an atraction through winter make this a popular choice in many street scapes. Platanus x acerifolia ‘Columbia’ with an upright habit & ‘Liberty’ with a more pyramidical habit are new cultivars surcharge reported to be more disease resistant. Large tree with a moderate growth rate slowing as it ages. Large green leaves from spring through summer turning to gold and then brown in autumn. Tolerant of a range of soil conditions and excellent in urban plantings where it copes well with pollution. Humus rich fertile well drained soil is best. Can be pruned easily, however best not having the crown opened. Flowers are insignificant followed by prickly seed pods. 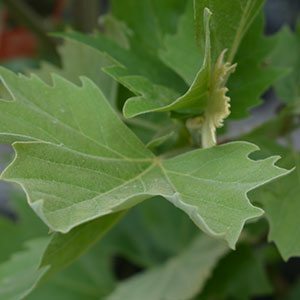 Allergy problems have been identified and the Oriental Plane Tree (Platinus orientalis ‘Digitata’ is now considered an alternative. Over time the root system can lift pavements, however it is a tree that takes well to root pruning, and with appropriate placement this can be overcome. FLEMING’S NURSERIES (03) 9756 6105 Strictly wholesale.